'Gold Card' holders have struck gold at The Thames. A new initiative has been introduced at The Treasury research facilities at Thames. Gold card holders are welcome to come, free of charge, and read any of the material held in the Reading Room. This is to give older members of the community the opportunity to come and enjoy the growing numbers of books and articles that are available. All you need to do is show your gold card and admittance is free during opening hours, should any research be required, then normal entrance charges apply. 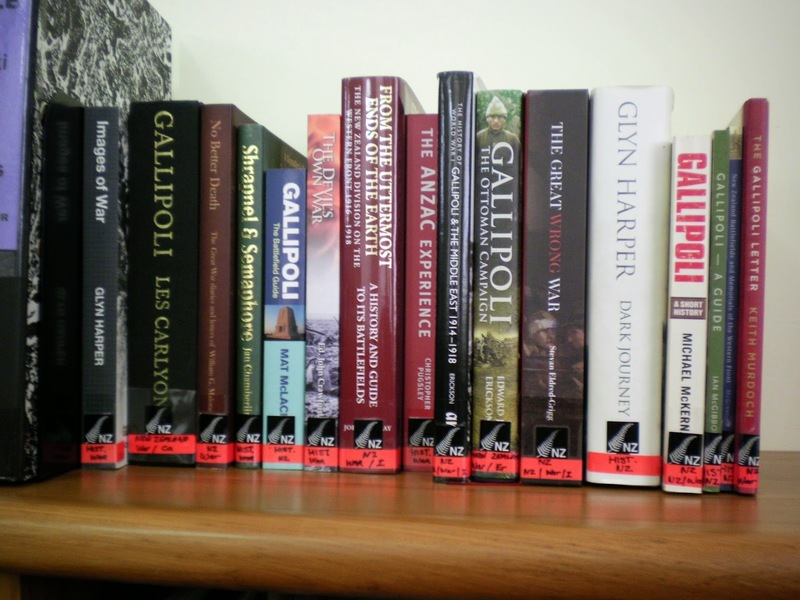 Maybe you would like to read the WWI collection of books and manuscripts? 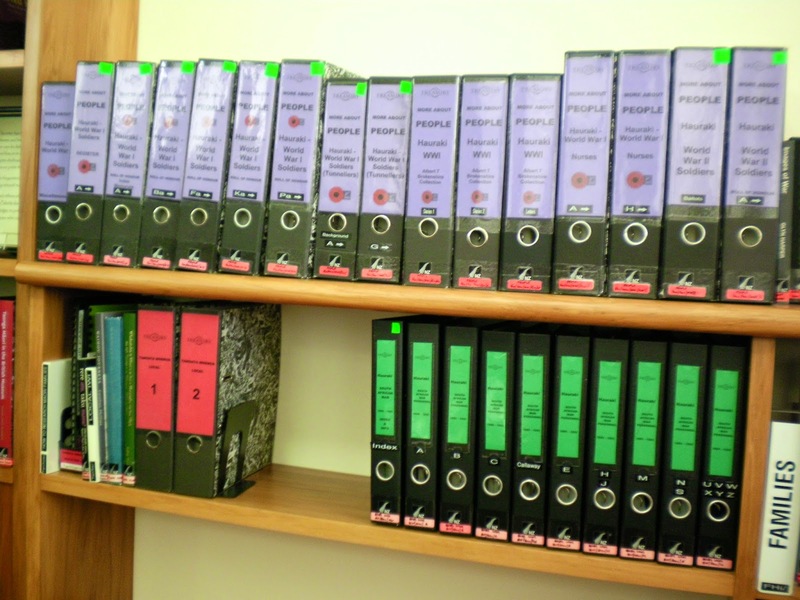 Some of the family history or centennial/reunion books from all around the Coromandel Peninsula and greater Thames Valley area? The volunteers at The Treasury look forward to meeting you all soon, and will point you in the direction of books that may be of interest. Relive the memories of the past - stop in for a 'reading break' in the near future. The celebrations marking the Thames Diamond Jubilee in 1927 were well attended; a special day was also held in Auckland for those who were unable to make the trip across the Firth. Below are photos of some the Thamesites who attended the Auckland based celebrations. SEQUEL TO THE THAMES DIAMOND JUBILEE: EARLY RESIDENTS OF THE GOLDMINING TOWN REUNITE IN AUCKLAND. Some of the survivors of the old days, who could not attend the recent celebrations at Thames, photographed at the function at the Town Hall on Saturday. Above: Mrs Smith, aged 87, and her daughter, Mrs White. Centre: Mrs Skinner being assisted from a motor-car. Above: Captain and Mrs Newby, aged 93 and 83 respectively. The gathering had been organised by The Old Thames Girls' Association and was attended by over 700 people. "There were many among them who went to Thames when it was little more than an uninviting wilderness. They had gathered to revive old friendships, and to call to mind the heroic efforts of their follow pioneers, and during the addresses not a few showed visibly the emotion born of poignant recollections." There was a magnificent birthday cake for all. "Standing out from the decorations of bunting and fernery was a huge birthday cake of four tiers, which was placed in conspicuous position in front of the stage. This was the gift of Mrs H. H. Adams, herself a pioneer of the Thames district. The cake was decorated with icing-sugar shovels and picks and a neat miner's cottage. On it were placed 60 candles, and the whole was surmounted by a diamond-shaped tier from which were suspended golden-coloured bells." There were tributes paid to many old settlers including Mr A E Glover. "Among the very earliest to settle at Thames was Mr A. E. Glover, who secured number 9 miner's right on the day these were first issued. 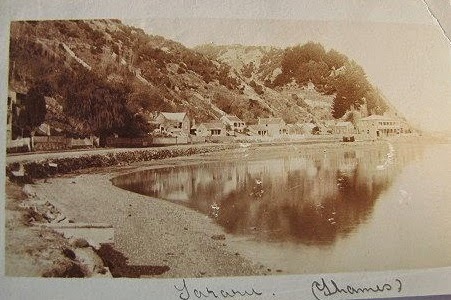 Mr Glover first went to Thames in 1863, four years before the discovery of gold. His parents were living at Coromandel, and with a brother he used to row to Thames in an boat. He made several visits to the district when there were no white persons at all there, and he was at Thames when the great rush for gold commenced. Debt Owed to Pioneers." 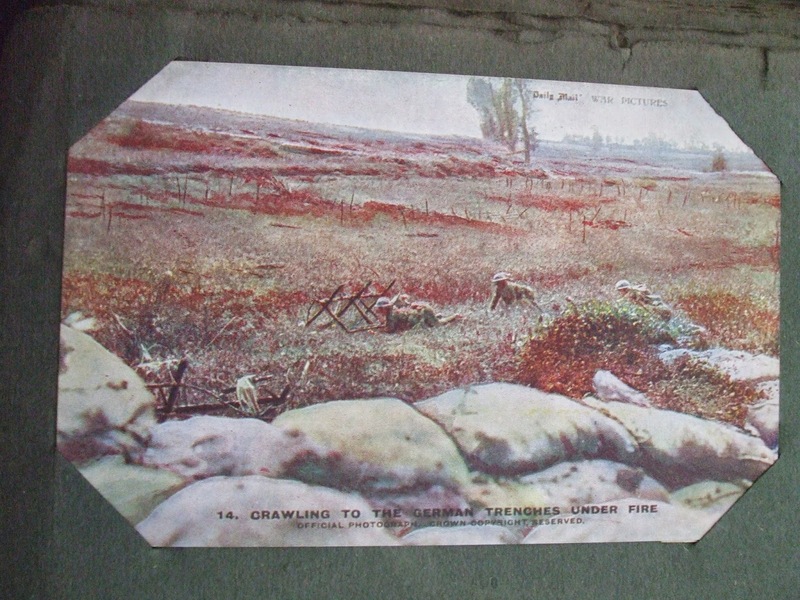 For sale at an online auction site, is a postcard addressed to Miss Mabel Harold of Mt Pleasant, Thames. The writer is Nell of Tararu, who remarks that "no news this time for it is not long since I last saw you." How easy it is to forget, where we may get on the phone or email, take a drive round town to see some one - that this was not the case a hundred years ago. Living at either ends of Thames would have meant that you may well not have regularly seen or heard from family and friends. Peter and Annie Harold lived at Mt Pleasant Thames in the early 1900s. Peter is recorded as a farmer in the street directories. There is a child by the name of Annie Mary Mabel Harold who is born to a Peter and Annie in 1886 - the birth is registered in Thames. Mt Pleasant being the flat area below Shortland Cemetery, now all residential housing, was the site for farming and orchards in the early years of the town. The postcard dates to post 1900, with the use of the one penny universal stamp on the back. By 1911 the Harold family were living in Mackay Street, Thames. (Electoral Roll below). In 1915, Annie and Peter Harold received the news that their son Edward had died overseas, during World War One. From a history and genealogy perspective, this is a quick example of how you can take one item of memorabilia and turn it into a story that will enhance your genealogy journey. NOT MAORI LINGUISTS. Tourist (from the South, on an Upper Thames trip) : By Jove I there's a swell name on that station. "Eyeeoosher" eh! Sounds quite Eastern. 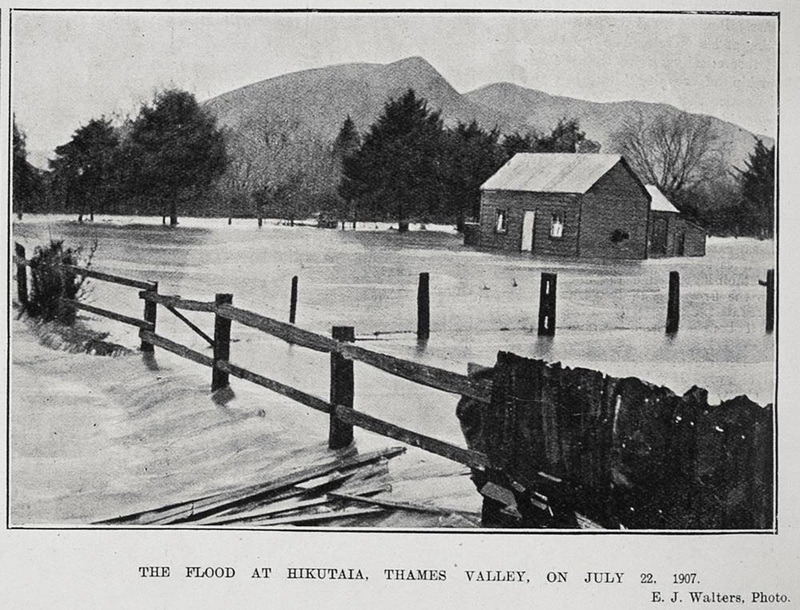 A few months later in July 1907, there was a flood at Hikutaia. Severe flooding of paddocks and the railway line - which temporarily disrupted train services. Duck shooting has always been a popular recreation/sport for Thamesites and those in surrounding areas. As the years have gone by, some may not find it as acceptable. Regardless of this - the sound of gun fire rings out across the firth on the weekends of late. One hundred years ago in 1914 it was not uncommon to shoot a large quantity of birds. On May 5 1914, the Thames Star reported: In connection with the duck shooting parties now out, local sportsmen are meeting with fair success. Mr E. J. Clendon's party has returned with 80 brace, while another local party secured 60 brace. So far Mr Clendon has secured the biggest bag. 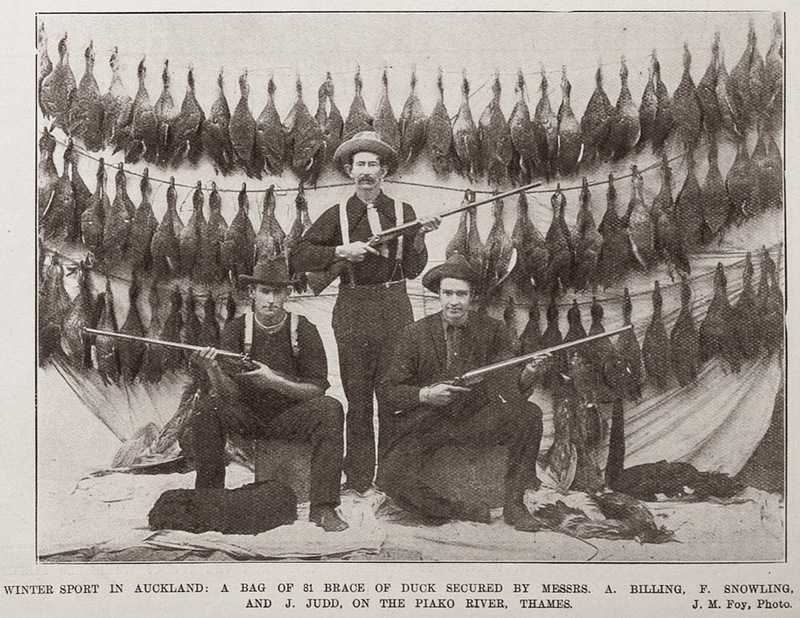 WINTER SPORT IN AUCKLAND: A BAG OF 81 BRACE OF DUCK SECURED BY MESSRS. A BILLING, F. SNOWLING, AND J. JUDD, ON THE PIAKO RIVER, THAMES. 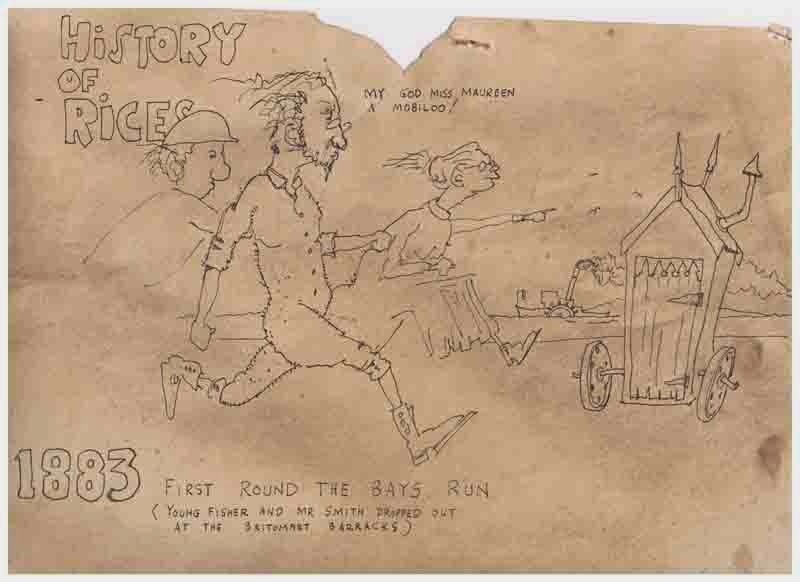 Back in the 1980's, Doug Barker of Thames was prolific in producing cartoons of Thames events and in particular, he focused on his fellow workers at A & G Prices of Thames. Thanks to a worker who saved them being destroyed, they still exist today. They need a clean and will be scanned, indexed and copied at The Treasury in the near future. One of the cartoons is below; a common theme was taking an event happening in a given year and drawing it in context 100 years before. Price's being known as Rices. Note in this one the Wakatere paddle steamer ambling along the gulf. The moral is, please don't discard of any documents and photos related to Thames - check with places like The Treasury, so these treasures can be saved. A memory of the grandeur that once was Brown Street, can be seen in the 1930 photograph below. The remnants of Grahamstown stood for many years until buildings were destroyed by fire or man, as many buildings were empty and abandoned.